Email Us Today! Adcock's Trapping Trusted For Wildlife Removal, Pest Control and Home Repairs in Maryland, Washington D.C. and Northern Virginia. We all love to sit and watch the wildlife that is so abundant in this area. Unfortunately, when that wildlife decides to take up residence in our home or on our property well then they are not quite so cute. There is no shortage of wildlife in the area. Raccoons, squirrels, flying squirrels, skunks, opossums, groundhogs, bats, birds, pigeons, snakes, rats and mice can be seen in and around our yards. From time to time new homes and businesses are built and the natural habitat of these creatures is encroached upon. Animals are forced to look for new nesting places. Many times this ends up being inside your home. These critters are well adapted in finding ways to enter crawlspaces and attics. Once inside, their natural tendency is to burrow and gnaw. Wildlife will build nests by chewing wall material and insulation. They can potentially chew through wires, insulation and water pipes as well. The best strategy is prevention and exclusion is the key. Exclusion can be difficult especially for small animals such as mice, snakes and bats. 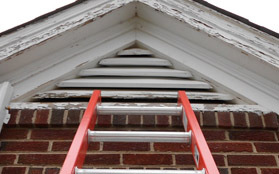 At Adcock’s Trapping we have skilled technicians with a strong background in constructions that are able to resolve the problem permanently whenever possible. Spring is just around the corner. With spring comes the problems of nuisance wildlife pest problems. Spring is the birthing season for many species of wildlife animals that may want to get into your home as the attempt to build a nest. Your attic is a perfect place for them to raise their babies. If you are hearing scratching noises in the attic or in the walls, you may have an animal problem in your home. We can do an inspection and let you know what type of wild animal problem you may have and give you option on how to trap and remove those animals. 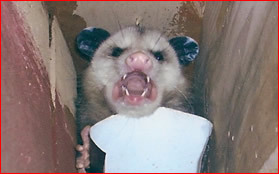 Adcock’s Trapping can locate the source of your wildlife problem and remove the animals from your home. We can also seal up the entry areas and clean up the mess that they have left behind. Adcock’s staff is trained in all forms of animal wildlife removal. We specialize in the removal of bats, birds, skunks, snakes, squirrels, raccoons, beaver and all other wildlife that may be infesting your home. 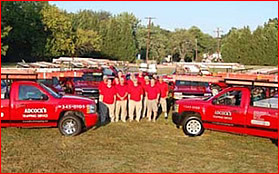 We have three generations of experience in wildlife removal and home repair. Let our family help your family. Call us today. Adcock’s Trapping offer full service home repair. Wildlife can cause a great deal of damage to your home. Raccoons, squirrels, bats and other animals will destroy your roof in trying to enter your attic. An attic can be a great place for wildlife to build their nests. In building their nests, they will destroy your home. We are trained to not only remove the animals from your home but also repair the damage. We can fix the damage that they have done to your roof. We will animal proof your home to ensure that they cannot return. We can clean and deodorize your attic and repair the damage caused by animals and the insects they carry. Adcock’s Trapping Service offers a five year warranty on all repairs made to your home unless otherwise noted.